Home > Blog > Marketing Hints > Is the design of your website losing you sales? I’ve worked with a number of people whose focus when they talk about the design of their website is purely on aesthetics. But they’re missing the point: graphics and colours are only a part of website design – and not the most important part, either. Graphics and colours that one person likes may be detested by another. Possibly enough to make them immediately leave the site. So what is the most important thing to work on when designing a website…? Consider websites you have visited in the past. You probably found some of them easy to use (a positive user experience) and some of them confusing and frustrating. You may even have given up and left. But it was probably not the colours and graphics that created your experience. Most likely it was the convenience, the ease of use, the ease of finding what you needed, the clear description of what to expect next and an easy (and obvious) means of going back a couple of steps if you want to. This is what we mean when we talk about the user experience or creating a smooth customer journey. And there’s a lot of thought, planning and effort that goes into creating a good one…! But first let’s create a common starting point. Before considering the user experience on a website the first thing to do is understand the objective of both the website and each page on the site. What is the website there to do? To sell stuff? To get people onto a mailing list? To raise corporate awareness? Whatever it is, it must be clearly understood. And then the job of each page on the site is to move visitors towards achieving the site’s purpose. Your website will have achieved its purpose when your visitors end up on the page that confirms completion of the transaction. If you are selling stuff this would be the confirmation or ‘Thank you’ page after checkout. If you’re building a mailing list then it would be the confirmation page after signing up. I will call this the completion page – because you have converted your visitors into customers or mailing list subscribers. The website has done what it was supposed to do. The page immediately before that will be the conversion page – the checkout page or the sign-up page. Keep these pages in mind because as we go through this article I’ll talk about the customer journey: how they move from the page through which they entered your website, through the conversion page to the completion page. Creating a good user experience starts at the very beginning of your project – with a plan. When you build a house, you create a blue-print before you start because that enables you to consider your options, make changes and arrive at the best solution quickly and easily. It’s a lot simpler to move a bathroom from the top floor to the ground floor when it’s on a plan than after the house has been built. The same applies to a website. Is it immediately clear what the visitor can expect to get from your website? The moment a visitor reaches your website the question in their mind is ‘Can I find what I want here?’. It doesn’t matter whether they want information, a product or a service, they need to know immediately that they’ve arrived at the right place. Making it clear helps them, and it has another important benefit: it helps the search engines as well, which means that it’s more likely that the ‘right’ type of visitors are arriving on your site from a search engine. Is the navigation menu clearly structured? The navigation menu is a critically important part of the user experience and yet I’m regularly shocked at how badly some of them are structured. Structuring the menu well starts with structuring the website well, which is why we recommend creating a plan before you start. There are actually two documents that we recommend you create: a structure of the site (like an organisation structure in a company) and a user journey, which I’ll cover later. The structure of your website should start with the Home page (think of it as the CEO) followed by the pages that will be accessed directly from the Home page (the CEO’s direct reports). These will be the most important pages on your site – the ones that provide important information or that will get your visitors to the conversion page as quickly as possible. Below these first-tier pages you may have some second level pages. These cover content that’s related to one of the first-tier pages, but it could be in greater detail or from a different perspective, so that it warrants its own page. They will have a parent-child relationship to a first-tier page, but they must cover related content. These will show up as drop-down or sub-menu items under their top-level parent. Getting the relationships between these pages right in your menu structure is an important step towards delivering a good user-experience but, as I’ve said already, it takes thought and planning. 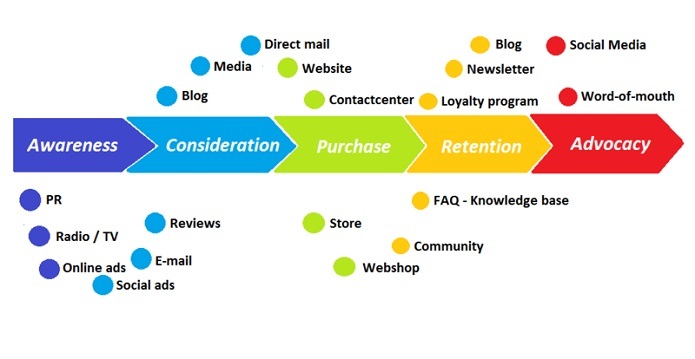 The user journey – which page on the site do you want visitors to reach? As I said earlier, the user-journey will be complete when the site visitor arrives at the completion page. The last stop before they get there is the conversion page so your initial target is to move them as quickly and smoothly as possible to the conversion page. Important: A visitor can arrive on your website through any page – not just the Home page. It’s theoretically possible they could arrive on your site at the completion page. Of course, you would not want that, so the completion page (and the conversion page) are generally blocked from the search engines, ensuring that visitors arrive at one of the other pages. This is why I talked earlier about how each page on the site needs an objective that contributes to achieving the site’s purpose. Whichever page the visitor lands on in your website they need to be encouraged towards your conversion page. The visitor’s journey to the conversion page is not always a straight line (see the graphic at the top of this article! ), which leads us back to the navigation menu and the need for visitors to find answers to their questions quickly and easily. When a visitor finds them self on your site it’s imperative that they can quickly and easily find their way to wherever they want to go, from wherever they are. Again, I’m shocked at the number of sites I visit where I browse around a bit and then want to get back to the home page, or my entry page, but I cannot find any way to do so. A poor navigation menu will result in a confusing customer journey and a poor user experience. Sometimes visitors are sent to a sub-domain (for example, you visit a blog post that’s sitting on the subdomain called blog.yourdomain.com). Very often the menu layout here is different from the main site, and different tabs are displayed – and now the risk is that your visitor is totally lost (and you’ve lost a sale)! For this reason we recommend the second document I referred to above: a flow chart that maps out the user journey. Once you have mapped out the user journey from each type of page on your site (Top level pages, blog posts, second level pages, etc) you will then need to focus on the content that will encourage visitors to take the next step along their journey. Ideally you want them to take the shortest possible route from where they are to the conversion page, but it’s OK to send them via a detailed information page if the circumstances call for it. When you send visitors to your conversion page via an indirect route the content on your interim page becomes even more important, because it has to keep them moving forward. What about those colours and graphics? Yes, as you will have noticed, we haven’t even touched upon colours and graphics yet. As I said at the outset, these are less important than the customer journey but, of course, they are important – and they do contribute towards the user experience. Colours and graphics must support the customer journey, without getting in the way. As I said earlier, colours and graphics are subjective: a great colour scheme to one person can be a turn off for another. For this reason, our approach at Abledragon is ‘less is more’ because this helps to reduce the chances of colours getting in the way of the customer journey. So what’s the take-away from all this…? In my view, time spent on planning the structure of the site, the navigation and the customer journey will always be well spent. Visitors have to be able to easily find their way around your site and do what they came to do without feeling insecure, wary, confused or lost. Your customer journey should be highly intuitive, and this takes thought, planning and time – but getting this right is how your website will fulfil its purpose. At the end of the day, if you do need to make adjustments, changing colours is quick and painless, whereas changing a customer journey is not.